If you saw something like this falling from the sky, you might think that the weather outside was indeed frightful. 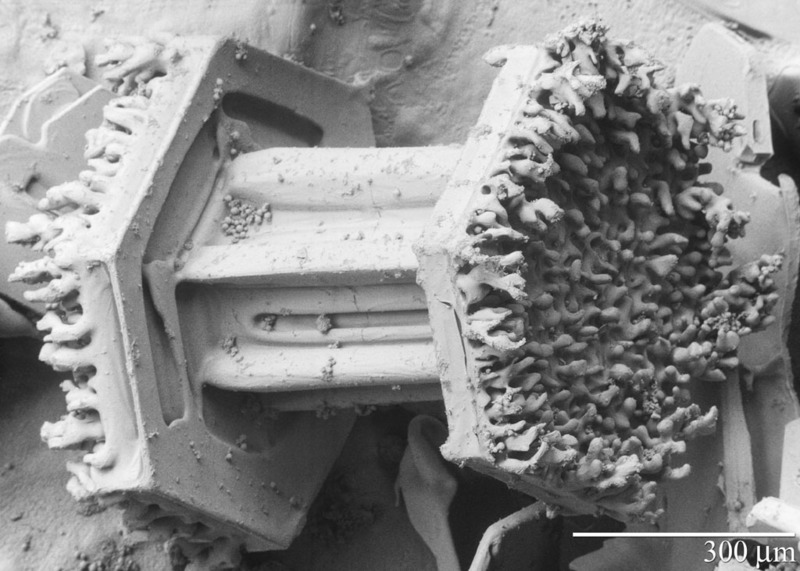 But this dumbbell shaped object is, in fact, a super-magnified snowflake — yes, a snowflake. Not so frightful after all. This particular snowflake is a capped column, one of many types of snowflakes. The fuzzy texture on its two hexagonal ends is called rime. Sometimes, when a snowflake, or snow crystal, passes through a cloud on its way down to earth, it collides with super-cold water droplets—clouds, after all, are just a bunch of coalesced drops of water. This collision causes the cloud’s water droplets to freeze and stick to the surface of the snow crystal. When these frozen droplets accumulate on the crystal’s surface, the snowflake becomes bedecked with rime. If a snow crystal collects too much rime, its original identity can be obscured. Snowflakes that experience this type of identity crisis are called graupel. This snowflake’s portrait was taken by a low temperature scanning electron microscope.